For our latest chef field trip, we drag the Empellón maestro out of the kitchen for a little feline-fueled R&R at Soho's Animal Haven. And so it was that one muggy Tuesday afternoon, Stupak, his wife Resler, and their friend, food writer Jordana Rothman, found themselves at Animal Haven on Centre Street in Manhattan, cooing at cute kitties. Fastidious, self-sufficient, self-cleaning—cats exhibit all the qualities of a good line cook. “We love all animals, but cats are the best because we’re out of the house 16 hours a day, and when we come home, they definitely chill me out,” said Stupak. Chilled-out cats have been a necessary antidote to Stupak’s increasingly frenzied life. The wunderkind chef quickly became a New York sensation after abandoning his posts in the pastry world—first at Chicago’s Alinea, then at Manhattan’s wd~50—to open up, of all things, a Mexican restaurant. After some head-scratching, media attention and accolades arrived: He was named one of Food & Wine’s Best New Chefs of 2013, and nominated for a James Beard Award. This fall, he and Resler, who is also a prodigious pastry talent, are poised to open their third restaurant on St. Mark’s place. 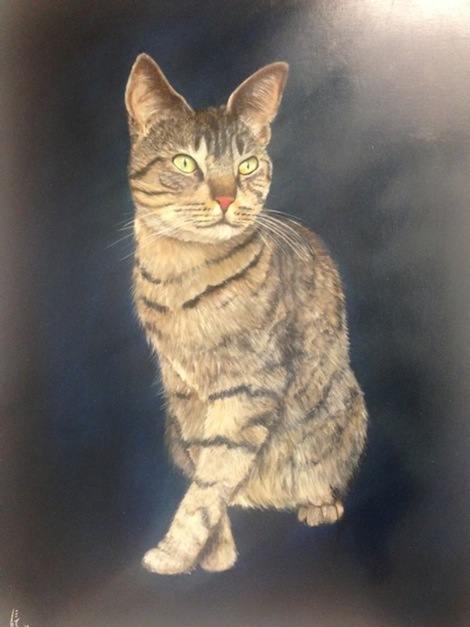 I stupidly put up a Craigslist ad for someone to paint a cat and got a million responses. Through it all—the long hours, intense ups and downs, the scrutiny—the cats have been a constant. A few years ago, Stupak and Resler decided to pay homage, beginning with Lee, cat #1, who weighs in at 17 pounds. 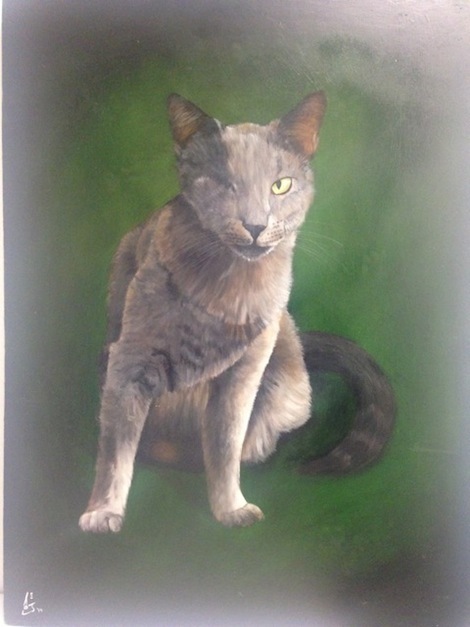 “I stupidly put up a Craigslist ad for someone to paint a cat and got a million responses,” Stupak said. He settled on Boris Jairala, an independent painter whose website hawks, in addition to photo-realistic paintings of pets, “HereAfter Frames” that are custom designed to “give you the option of combining your loved one’s image with their urn and keepsakes.” (Featured on the page are both humans and “Floppy,” a rabbit since passed.) A stoic portrait of Lee, looking stage right, now graces their first restaurant, and Jairala’s paintings of Percy and Charlotte will appear in the couples’ two other restaurants. Stupak remained mostly silent through the cat visit, though the stoic veneer crumbled in the kitty room downstairs. He lovingly bopped one striped kitten on the head for a while as it put up its tiny paws to protect itself, then grew calm as Resler plopped Amy Poehler, a black kitten, into his hands. Poehler sat there, in a sort of kitty plow pose with its paws up by its ears, purring audibly and matching his unblinking stare with wide eyes. Keeping eye contact with Stupak, Poehler stuck out her paw to touch Resler. It looked, for a moment, as if the Resler-Stupak household might have found themselves a new member, but a moment later, Stupak relinquished Amy Poehler to her cage and started to make his way uptown to Empellón Cocina.